The European Central Bank (ECB) maintained the Main refinancing operations rate unchanged at 1.50%, the Marginal lending facility at 2.25% and Deposit facility at 0.75%. The Bank said: "Looking ahead, we expect the euro area economy to grow moderately, subject to particularly high uncertainty and intensified downside risks. At the same time, short-term interest rates are low. While our monetary policy stance remains accommodative, some financing conditions have tightened. 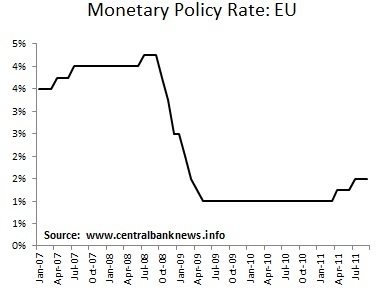 It remains essential for monetary policy to focus on its mandate of maintaining price stability over the medium term, thereby ensuring that recent price developments do not give rise to broad-based inflationary pressures... Inflation expectations in the euro area must remain firmly anchored in line with our aim of maintaining inflation rates below, but close to, 2% over the medium term. Such anchoring is a prerequisite for monetary policy to make its contribution towards supporting economic growth and job creation in the euro area. We will continue to monitor very closely all developments." The ECB last increased the interest rates by 25 basis points at its July meeting; pausing in May and June, after raising the rate by 25 basis points to 1.25% in April this year. The Euro Area reported annual HICP inflation of 2.5% in August and July, compared to 2.7% in June (same as May), 2.8% in April, and 2.7% in March, and above the Bank's inflation target of maintaining inflation below, but close to, 2% over the medium term. The Euro Area reported quarterly GDP growth in the June quarter of 0.2%, following a 0.8% increase in the March quarter, and a 0.3% increase in the December quarter of 2010. The Euro (EUR) last traded around 0.73 against the US dollar, having gained about 4% against the USD this year. In August the ECB stayed firmly in the headlines as it announced a resumption of its bond buying program (SMP - Securities Market Program) at its previous meeting, which initially did not include Spain or Italy, which caused a significant elevation in uncertainty. The ECB then signaled it would in fact expand the purview of that program, and made significant purchases (22 billion in the first week of renewed buying, and 14 billion in the subsequent week). The ECB also just announced the resignation of key board member, Jürgen Stark.